Cheers to Easter Burritos! Please join us at our Burrito Project events. We’d love to see you. SOCKTOBER was months ago, but we’re still collecting socks during this winter season! Please help us collect socks so we can distribute them to our neighbors living on the streets of Los Angeles. In September 2018, Danny Jensen from THRILLIST Los Angeles listed The Burrito Project in his 62 TOTALLY FREE THINGS TO DO IN LA (Who’s counting, but we were #9 on the list). If you are cleaning your closets, feel free to donate your gently used clothing. Bring the laundered clothing and blankets to The Burrito Project and we’ll sort it so we can give it out that evening. Are you looking for a way to be more involved in the community? Are you looking for a way to GIVE BACK? 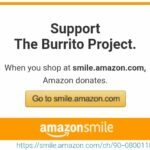 The Burrito Project may be the perfect event for you. * A case of bottled water. * Warm “gently used” clothing, jackets, sweaters, shirts, pants, etc. If you have yet to join us, then THIS is the PERFECT time to get involved, make new friends & join in the fun! (We are GUESTS of the St. Joseph’s Food Bank, so this is generally a 21 & over event. If you would like to participate & you or your guest are under the age of 21, please contact me directly & we can discuss the details. Thank you). The Burrito Project is a group of really cool & groovy people (like YOU) who get together & make burritos. Once the burritos are made, we caravan/carpool to downtown Los Angeles and we deliver the burritos along with bottled water to the homeless in downtown LA. We gather on the THIRD Thursday evening. THIS MONTH we will be in SOUTH PASADENA. We start gathering between 6:30-7:30 so we can prepare the kitchen & start warming up the 850+ tortillas needed for the night. Join us for quesadillas, beverages & conversation. We officially start the “festivities” about 7:30pm. #1 – You MUST have fun, smile & make new friends while making Burritos. #2 – Please invite OTHER Cool & Groovy People to join in on this fun & worthwhile service project. #3 – Please bring a $10 donation (or more if you’re feeling EXTRA generous) to help offset the cost of the Burritos Ingredients. #4 – When we are done making & wrapping burritos, (and cleaning up the kitchen) we carpool to the “distribution location(s)” in downtown LA & Pasadena area. I look forward to seeing you on Thursday the 18th of April. I really appreciate your time. (If possible) Please bring your ENERGY, Smile & ANY donation you feel inspired to give). Your donation helps to offset the cost of bottled water, tortillas, salsa & other burrito ingredients (which are not donated). We have 2 Phases of The Burrito Project event. You are invited to BOTH phases, but you can also choose to do Phase I or Phase II. ALSO, remember to wear comfortable shoes (closed toe shoes preferred) and dress appropriately for the weather. Spring is here, the days are warm but the evenings can cool down quickly!